I'm really happy to be able to release my first eBook: The Cheats' Guide to Customizing Blogger Templates. Based on the original article published here, this eBook will offer you many options and examples to customize your existing Blogger template quickly and easily, whichever style of template you are using.! Read on for more information and to download this free eBook. 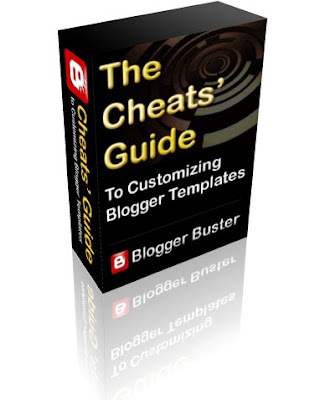 The Cheats' Guide to Customizing Blogger Templates eBook is available in PDF format. The Cheat's Guide to Customizing Blogger Templates eBook is licensed under a Creative Commons Attribution-Noncommercial-No Derivative Works 3.0 Unported License. This means that you are free to redistribute this eBook for non-commercial purposes, without modification, so long as you include a link to the original author. Please send me an email if you have any questions about the content or usage of this eBook, and I'll get back to you as soon as possible. If you've found The Cheats' Guide to be a useful read, why not help me spread the word so that others can find this too? It has taken much time and effort to complete this eBook, so I would really appreciate any and all publicity I can get! I would love to read your thoughts and opinions about this eBook, so please do leave your comments and suggestions below.